Can’t decide on whether to choose a modern PC Oscilloscope or a traditional benchtop oscilloscope? With class–leading bandwidth, sampling rate, memory depth and a built–in arbitrary waveform generator too, a PicoScope 5000 Series PC Oscilloscope makes it easy for you to make the right choice. At the heart of the PicoScope 5000 is its ability to digitise signals accurately and with minimal distortion. The 250 MHz analog bandwidth is complemented by a real–time sample rate of 1 GS/s. For repetitive signals, an equivalent time sampling (ETS) mode increases the sampling to 20 GS/s. PicoScope 5000 oscilloscopes are supplied with PicoScope 6 oscilloscope software which allows you to use your PicoScope PCO as an oscilloscope, spectrum analyser and meter. PicoScope 6 is responsive and easy to use. Feature–packed, PicoScope includes draggable axes, advanced zoom tools and a waveform replay tool which automatically records up to the last 1000 waveforms. PicoScope 5000 PC Oscilloscopes have been designed to take up very little of your valuable desk space. The innovative anti–slip case design means that the PicoScope 5000 PCOs can be used either horizontally or vertically — ideal when desk space is at a premium. Unlike traditional benchtop oscilloscopes, PicoScope 5000 PC Oscilloscopes are lightweight and small enough to be carried in the same bag as your laptop, but for added protection you can use the supplied tough carry case. Despite the compact design, the case can safely store and protect your oscilloscope, leads, probes and power supply. With class–leading bandwidth, sampling rate and memory depth, and an array of advanced high end features, PicoScope 5000 PC Oscilloscopes give you the features and performance you need. 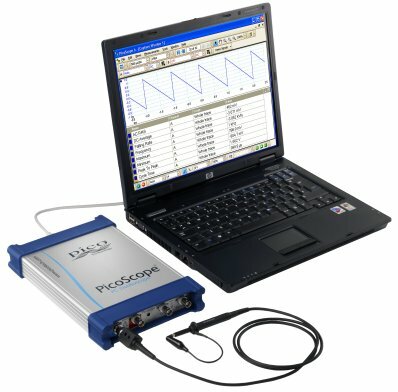 PicoScope 5000 oscilloscope are an ideal direct replacement to benchtop oscilloscopes. They are easy–to–use and cost–effective. The award–winning PicoScope 5204 is the vanguard of PC Oscilloscope design, whilst for those on a budget, the PicoScope 5203 has all the performance of the 5204 but with a smaller, though still impressive, 32 megasamples of memory. 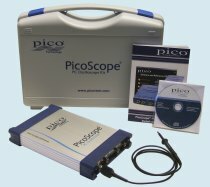 Buy your PicoScope 5000 PC Oscilloscope online or from your local Pico distributor.